AYP Takes Over Orlando, Atlanta, Durham! Handstands Hugs & Happiness Tour ROADTRIP! in Orlando, Atlanta & Durham! When I first got involved with AYP 2 years ago, the impact statistics were pretty impressive. Over 250 teachers trained in 13 countries in Africa, reaching hundreds of people PER WEEK through over 300 free yoga classes in Africa. The IMPACT of AYP is huge, and is only made greater by YOUR support. Danielle is taking a roadtrip with Millie & Lizie and hitting the three home cities of each 3oms founder. Over 70% of young people in Nairobi are unemployed! It's hard to see the light at the end of the tunnel when you live amidst a statistic like that. Through AYP, hundreds of young people have an opportunity to train as wellbeing professionals and are now earning a living wage through teaching yoga, developing yoga based products (i.e. yoga blocks made from recyled flip flops!) and more. 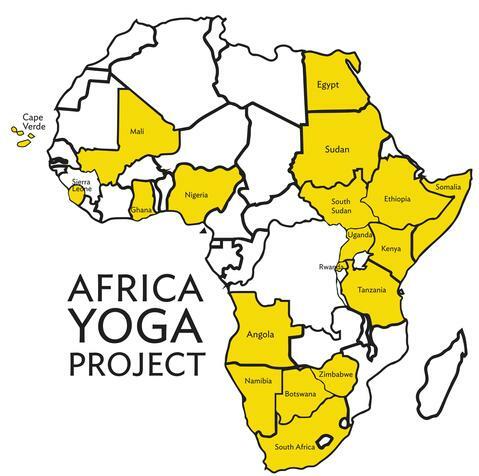 EACH YEAR Africa Yoga Project sends at least 4 teachers to the US to tour the country and visit yoga studios, fitness centers, nonprofits, schools, and more. The teachers get to further threir skills through leading yoga classes to all different populations and grow as professionals through learning about the booming wellbeing industry in the US and networking with lots of experts in the industry. Each community will be left with a fun, exciting, and once in a life time experience that dissolves borders and brings connection, understanding, and love. for young people in Kenya to gain professional skills through the AYP 3-year academy. Jeff Herrick 10/25/2018 $50.00 CPY AYP !!! Erin Towne 10/25/2018 $50.00 CPY AYP!!! Danielle Cosgrove 10/25/2018 $165.00 AFRICA YOGA PROJECT IS THE BEST! Warrior ONE Students 10/24/2018 $566.00 COMMUNTY! Charina Shields 10/24/2018 $40.00 Thank you for coming to Atlanta! Amy Jacobs 10/24/2018 $25.00 Wishing you girls love and light as you spread your passion and joy! Dawn Chatham 10/24/2018 $25.00 God bless you! Keep going Yogis! Emily Parkins 10/23/2018 $25.00 AYP LOVE!!!!!! Emily Walsh Ribeiro 10/23/2018 $20.00 Karibu!! Jessica Straight 10/23/2018 $30.00 I’m bummed I missed tonight but I hope you enjoy your tour and reach your goal!